It’s been a while since we have seen desi girl Priyanka Chopra on-screen in Bollywood films. ‘Jai Gangajal’ was Priyanka’s last film and since then, she has been busy with her Hollywood commitments. 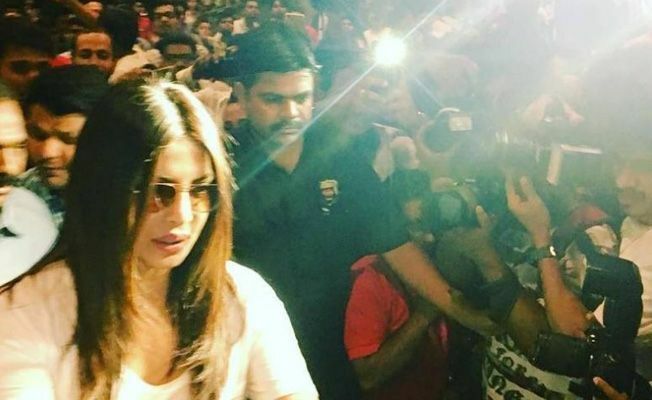 But now PeeCee is back and everyone wants to know which project she is taking next. After playing a badass villain and an FBI cop, Priyanka is all set to explore the outer space world. According to a media report, she has signed a biopic based on late astronaut Kalpana Chawla. There were rumours that the actress was offered the lead role and now has locked this project. The film is being helmed by debutant Priya Mishra. “I have been working on it for the past seven years. A new production banner will back the project. I was last heading a TV channel creatively and post 2011, quit to pursue filmmaking. This is one of the two scripts that I have written,” Priya Mishra told Mid-Day. For people who don’t know Kalpana Chawla, she was the first female Indian astronaut who travelled to the outer space. Born in Karnal, Haryana in March 1962, Chawla studied in Tagore Bal Niketan School and completed aeronautical engineering from Punjab Engineering College, Chandigarh. In 1982, she moved to US and six years later she started working with NASA. However, in February 2003, she and her fellow mates died when her space shuttle Columbia exploded. “The talks are going on. It’s still a work in progress. If everything goes as planned, one can expect Priyanka to soon start working on this film,” says a source close to the team. If the reports are to be belived, this will be Priyanka’s second biopic film after Mary Kom. But other reports claim that the actor has signed ‘Pink’ director Aniruddha Roy Chowdhary’s thriller film. However, nothing official has been announced yet. So is Priyanka all set to explore the space or get in the grey mode? Guess we still need to wait to know more. Meanwhile, Priyanka is back to Mumbai after wrapping up the second season of ‘Quantico’ and will be seen promoting her Hollywood debut ‘Baywatch’ also starring Dwayne Johnson and Zac Efron.